Henson Scout Reservation, also known as Camp Nanticoke, is an 1,800-acre (7.3 km2) Scout camp located on the Delmarva Peninsula near Galestown, Maryland. One of two Scout camps on the peninsula, it serves thousands of Boy Scouts and Cub Scouts throughout the summer months, and is open year-round for special Scout programs and for rental by outside groups. Boy Scout and Cub Scout summer programs are run separately. Named for the famous aviator and philanthropist from Salisbury, Maryland (Richard A. Henson), Henson Scout Reservation has been in continuous operation by the Del-Mar-Va Council since the summer of 1965. The camp was originally known as Camp Nanticoke, which is now the name of the primary camping area. (The original plan was to develop two camps on a single reservation — Camp Nanticoke and Camp Choptank — but that never materialized.) Today, the entire reservation is still known by many as simply "Camp Nanticoke." The camp's largely undeveloped 1,889 acres (7.64 km2) are widely recognized as an environmental gem, with habitat for countless birds, mammals and fish, including the bald eagle. The entire camp was protected in a conservation easement in partnership with The Nature Conservancy. Henson Scout Reservation offers a wide range of traditional Boy Scout summer camp programs, including swimming, nature/ecology, handicrafts, Scoutcraft (camping and outdoors skills), archery, rifle and shotgun shooting and fishing. Its first-year camper program, known as Brownsea, is extremely popular. Located on the Marshyhope Creek, a tributary of the Nanticoke River, the camp has a thriving waterfront program, offering canoeing, rowing, sailing and motorboating. It also has a fitness program, including physical fitness, biking and golf merit badges. For older Boy Scouts, the camp offers a high adventure trekking program, involving a week-long canoe/bicycling trek around the Nanticoke River watershed. Its Eagle Base program is designed to give older Scouts the opportunity to earn specialized merit badges required for the Eagle rank. While traditionally Cub Scouts have participated in day camps, Henson Scout Reservation offers an overnight/resident camp, designed to introduce Cub Scouts to the basics of camping in a supportive, structured environment. It offers 3-day, 2-night sessions for both Cub Scouts and Webelos and weeklong sessions just for Webelos. Each year's programs are thematic. The summer 2008 theme is Wild West. The 2007 theme was "Exploring the New World," marking the 400th anniversary of Capt. John Smith's exploration of the Chesapeake Bay. 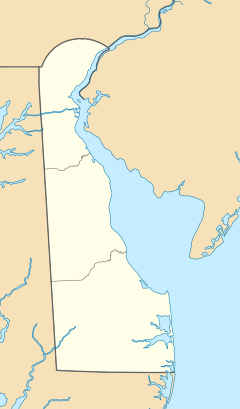 Rodney Scout Reservation, operated by the Del-Mar-Va Council, Boy Scouts of America, is located on 900 acres (3.6 km2) of rolling upland woodlands at the head of the Chesapeake Bay and boasts over a mile of prime bay frontage. It has been in continuous operation since 1923. Rodney is located in Cecil County, Maryland, about 6 miles (9.7 km) Southeast of Interstate 95 or Maryland Route 40 off Maryland Route 272 near North East. The camp location provides easy access from Baltimore, Washington, Wilmington, and Philadelphia. It is on the site of an old abandoned iron mining site formerly titled Whitaker Iron. In 1922, DuPont gave much funding for the fledgling Scout camp that has multiple facilities, campgrounds for roughly two dozen troops and many merit badges. Such activities include traditional Scouting programs as well as robotics, shooting sports, sailboating and power boating, rock climbing, cycling, and geocaching. From September to May, Rodney is open for weekend camping, staffed by the volunteer Rodney Campmaster Crews. Some weekends offer programs put forth by districts in Del-Mar-Va Council. Most weekends include a program such as orienteering, cooking, rifle shooting, or many others put on by the campmaster crews. Akridge Scout Reservation, operated by the Del-Mar-Va Council, Boy Scouts of America, is located on 85 acres (0.3 km2) of farmland in Dover, Delaware, and is the first Boy Scout camp in Delaware. Groundbreaking took place on September 17, 2011. The first event held there was a Council Jamboree on May 4–6, 2012. On July 29, 1925, an Order of the Arrow charter was granted to Unalachtico Lodge of the Del-Mar-Va Council. The lodge totem was the turkey. By the late 1930s, the lodge had become inactive and was disbanded. Through the efforts of the Delmont Lodge #43 of the Valley Forge Council, Lodge #20 was reorganized on June 22, 1957. The new name chosen by the membership was Nentego, a derivation of the name of one of the major Delaware Tribes, which means, "People from across the water." Delmont Lodge inducted two youth from each district and the council professional staff to provide the initial core of Nentego Lodge. The Lodge totem is the Rockfish, which can be found in the Chesapeake Bay. The lodge colors are blue, for the water of the Chesapeake, and grey, for the Rockfish. The first lodge flap appeared in 1957, and its basic design remains in use today. Section NE-4C was established in June 1994, following a realignment of the councils and areas of the Northeast Region. The Section had been formerly known as NE-6 until the 1994 realignment, which resulted in the elimination of Area 6 and the transfer of NE-6 charter lodge Ahthuhquog #540 to Section NE-5. Section NE-4C is now one of the three Order of the Arrow Sections in Area 4 of the Northeast Region. Section NE-6 was formed on May 22, 1982 when its five charter lodges were transferred with their respective councils from SE-9 in the Southeast Region to the Northeast Region. A sixth lodge, Black Eagle, transferred from NE-3A to NE-6 in June 1982. Section NE-6 continued as a group of six lodges until a 1988 realignment of the Northeast Region. In November of that year, Susquehannock and Tuckahoe Lodges from NE-5B and Wunita Gokhos from NE-5A joined Section NE-6. Since the formation of NE-4C, three lodges have been transferred to other sections, Ahthuhquog, Black Eagle, and Wunita Gokhos. ^ Hook, James; Franck, Dave; Austin, Steve (1982). An Aid to Collecting Selected Council Shoulder Patches with Valuation. ^ "District Information". Del-Mar-Va Council. Retrieved July 23, 2017. ^ "Camping & Activities - Henson Scout Reservation". Del-Mar-Va Council. Retrieved July 5, 2010. ^ "Henson Scout Reservation - History". Del-Mar-Va Council. Retrieved July 23, 2017. ^ "Save of the Week: Conservancy Partnership Protects 1,485 Acre Boy Scout Camp on Chesapeake Bay Tributary". The Nature Conservancy. Archived from the original on November 29, 2008. Retrieved December 8, 2008. ^ "Henson Scout Reservation - Advanced Summer Programs". Del-Mar-Va Council. Retrieved July 23, 2017. ^ "Henson Scout Reservatiaon - Brownsea Opportunities". Del-Mar-Va Council. Retrieved July 23, 2017. ^ "Camping & Activities - Henson Scout Reservation - Summer Programs". Del-Mar-Va Council. Retrieved July 5, 2010. ^ "Henson Scout Reservation - Eagle Scout Program". Del-Mar-Va Council. Retrieved July 23, 2017. ^ "Camping & Activities - Cub Scout Resident Camp". Del-Mar-Va Council. Retrieved July 5, 2010. ^ "Rodney Scout Reservation". Del-Mar-Va Council. Retrieved July 23, 2017. ^ "Rodney Scout Reservation". Del-Mar-Va Council. Retrieved September 27, 2010. ^ "Rodney Scout Reservation 2017 Leader Guide". ^ "Del-Mar-Va Council Camps". Del-Mar-Va Council. Retrieved August 20, 2011. ^ "Akridge Scout Reservation". Del-Mar-Va Council. Retrieved May 8, 2012. ^ "Akridge Scout Reservation Ceremonial Ground Breaking". Del-Mar-Va Council. 2011. Retrieved May 8, 2012. ^ "Nentego Lodge 20, Order of the Arrow". Nentego.org. Archived from the original on July 27, 2011. Retrieved July 5, 2010. Wikimedia Commons has media related to Scouting in Delaware. This page was last edited on 3 January 2019, at 03:00 (UTC).